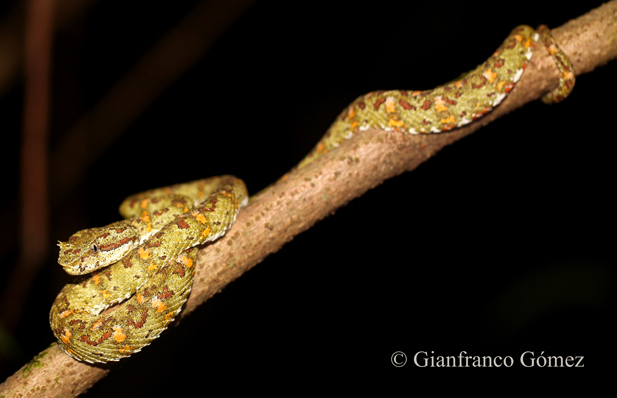 One of the most beautiful and impressive snakes in Costa Rica is the Eyelash Pit-viper, Bothriechis schlegelii. They have countless color variations, and many morphs have been documented and can be observed even in the same litter! An example of these amazing variations can be seen by following this link: http://blog.inbio.ac.cr/inbio/?p=690 to Alejandro Solórzano’s post in INBio’s blog. 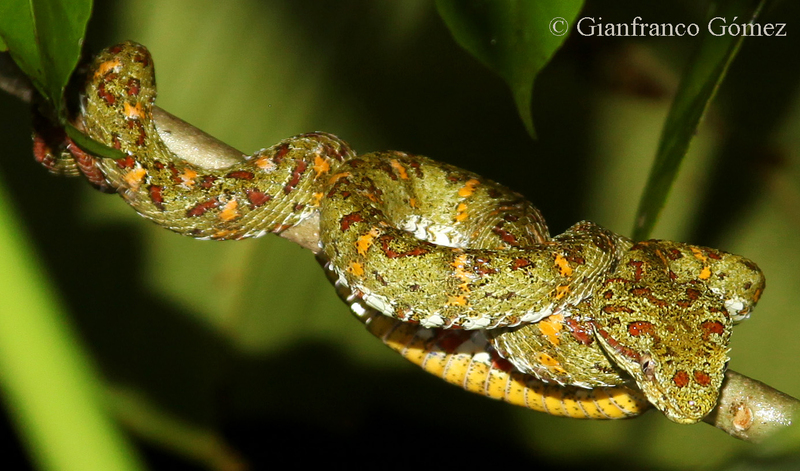 Like most other Costa Rican Pit-vipers, Eyelash Pit-vipers give live birth. The two births pictured on his blog were documented by Mr. Solórzano at the National Serpentarium. In Drake Bay all of the Eyelash Pit-vipers we have encountered have had some variation of the mottled, green morph shown on the photograph above. Curiously, in Corcovado National Park, at Sirena Station, the only individuals we have found have had the yellowish, mottled morph featured below. These small, arboreal snakes are found throughout Costa Rica’s lowland rainforests. Their common name is derived from the specialized scales located above their eyes. These curiously shaped scales curve upward, resembling eyelashes. The scales’ function is still unknown, although some scientists theorize the scales may provide eye protection to the snakes as they make their way through the thick, often tangled arboreal vegetation which they inhabit. lifestyle. These sedate snakes are sit-and-wait predators and may spend several days on a perch waiting for their prey to blunder by. When this happens, the lethargic viper springs into action with blinding speed and delivers its deadly bite. Once they have their prey, Eyelash Pit-vipers will hold on to it until it has succumbed to their venom. The venom not only kills its prey, but immediately begins digesting it, even before it is eaten. This allows Pit-vipers to take larger prey than non-venomous snakes. Prey items may include: lizards, frogs, bats and birds. Some scientists think that Eyelash Pit-vipers, especially the golden morph, may intentionally perch on flowers with the intention of ambushing unsuspecting hummingbirds as they come in to feed. Hummingbirds are very attracted to red and yellow….in this case a fatal attraction. In Drake Bay we don’t tend to see these amazing creatures as often as we do other snakes. 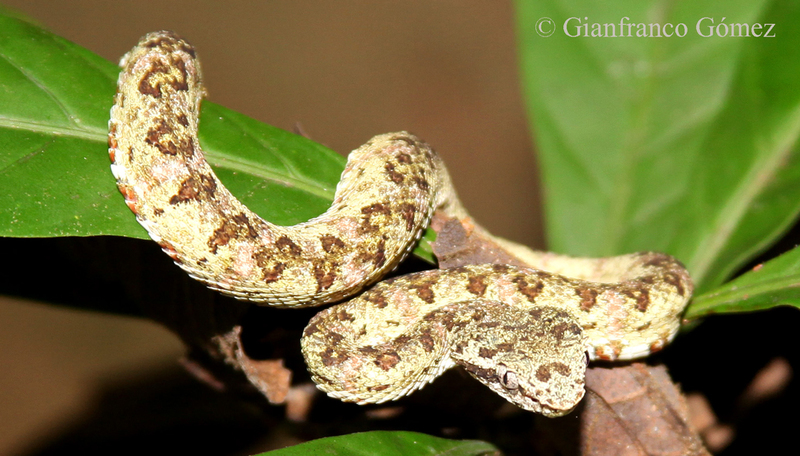 By far, our most common Pit-viper here is the Fer-de-lance, Bothrops asper. The last two nights we have been fortunate enough to have encountered a large (approximately 50 cm long) and incredibly beautiful Eyelash Pit-viper during the Night Tour. The snake’s photograph is included at the top of this post. 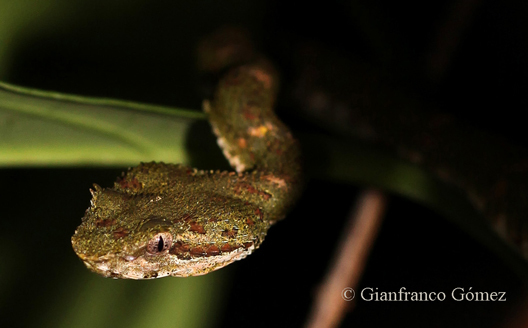 This entry was posted in Snakes and tagged bocaracá, Bothriechis schlegelii, Costa Rica, Drake Bay, Eyelash Palm Pit-viper, Eyelash Pit-viper, Night Tour by Gianfranco & Tracie. Bookmark the permalink.